Little Cakes 1/2 a pound of flour 1/2 a pound of loaf sugar beat and sifted rub in 3 ounces of butter add a few carraway seeds mix them up with an egg cut them into small cakes and bake them in a cool oven. Little Cake 3 pounds of flour 12 ounces of sugar the yolk of 4 eggs 4 ounces of Butter mixed all togeather with old milk beat and yolk for one hour and a half and baked in a slow oven. Little Cakes 1/2 a lb of flowr 1/2 lb of sugar 1 tablespoonfull of carraway seeds make them into paste with 2 eggs bake them in a slow oven prick them well. 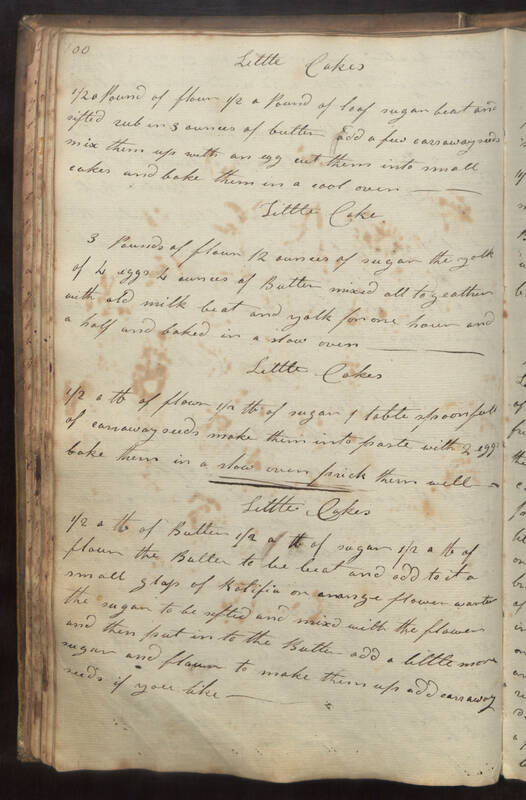 Little Cakes 1/2 a lb of Butter 1/2 a lb of sugar 1/2 a lb of flour the Butter to be beat and add to it a small glass of Ratifia or orange flower warter the sugar to be sifted and mixd with the flower and then put in to the Butter add a little more sugar and flour to make them up add carraway seeds if you like.